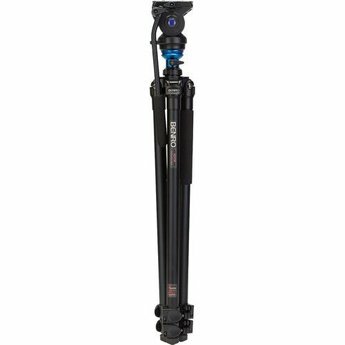 Benro's A2573FS4 S4 Video Head and AL Flip Lock Legs Kit features aluminum single-leg tube tripod legs with flip-lever leg locks, along with an S4 compact two-way video head. The S4 head has separate Pan and Tilt lock levers for lock-off shots. 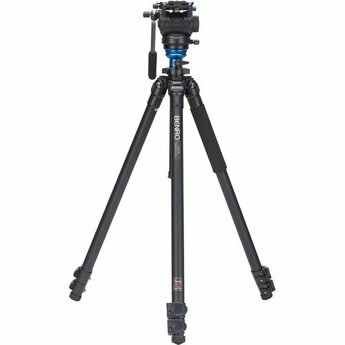 Benro's A2573FS4 S4 Video Head and AL Flip Lock Legs Kit features aluminum single-leg tube tripod legs with flip-lever leg locks, along with an S4 compact two-way video head. The S4 head has separate Pan and Tilt lock levers for lock-off shots. The QR6 sliding quick-release plate helps to balance the camera, and the head comes with a safety lock for the QR plate. The S4 Video Head accepts 501PL-compatible quick-release plates, making it easy to find spares or replacements. This head is equipped with an adjustable damping level reset mechanism that improves smoothness and stability in panning and tilting. The aluminum alloy legs are complemented with cast magnesium alloy components to produce a sturdy camera support.